WASHINGTON (Sinclair Broadcast Group) - While not all of America’s schoolchildren are gearing up for the new academic year just yet, some of those who are already back in class will get a rare holiday on Monday, Aug. 21 - an eclipse day. Akin to beloved snow days, this special holiday will be observed not due to inclement weather, but because of a celestial spectacle sweeping the nation: the first total solar eclipse to cross the entire continental United States since 1918. Some school districts along the Northwest-to-Southeast path of totality (where the eclipse is best visible), like the Charleston County School District in South Carolina and Metro Nashville Public Schools in Tennessee, have declared an eclipse day. In Nebraska, school will be in session Aug. 21 for Omaha Public Schools, where students are invited to witness history alongside their classmates and teachers. In Oregon, Portland Public Schools students remain on summer break until Sept. 5. But one thing is certain, educational experts say: whether students find themselves in or out of the classroom when the moon completely blocks the sun, a once-in-a-lifetime learning opportunity will arise. Rebecca Ljungren, astronomy educator at the Smithsonian National Air and Space Museum (NASM), echoes that view. Both the NSTA and NASM, as well as the National Aeronautics and Space Administration (NASA), have curated an array of eclipse-themed resources for teachers, students and parents. NASM says a live broadcast of its online “STEM in 30” program is “perfect for the national audience of students that will be in school [the day of the eclipse].” The Aug. 21 episode will be broadcast from the museum's Phoebe Waterman Haas Public Observatory in Washington, D.C. as well as the path of totality in Liberty, Missouri. Dr. Brian Mandell, the division director of curriculum and communications for the Smithsonian Science Education Center, says marvels like the total solar eclipse provide a great launching pad for educators. “Phenomena are naturally occurring, observable events. Think of the how the stars appear to move at night or why spider webs have different designs. They are both phenomena and have the ability to inspire students and anchor an entire lesson or unit for the teacher,” he said. When it comes to solar eclipse lesson planning, the sky is hardly the limit. NASA has dedicated an entire web page to eclipse education, featuring a wealth of tailored curricula for K-12 teachers, parents who homeschool their children, undergraduate professors, public libraries and more. In addition, NASA's Eclipse Activity Guide (see below) offers an exhaustive list of activities that can help budding scientists understand the solar eclipse. To accompany its solar eclipse viewing guide (see below), NSTA invites middle school teachers to incorporate "Solar Science: Exploring Sunspots, Seasons, Eclipses, and More" by Dennis Schatz and Andrew Fraknoi into their lesson plans: "Its usefulness won't end when the eclipse does. 'Solar Science' offers more than three dozen hands-on, inquiry-based activities on many aspects of solar astronomy. The activities cover the Sun's motions, space weather caused by the Sun, the measurement of time and seasons in our daily lives, and much more." 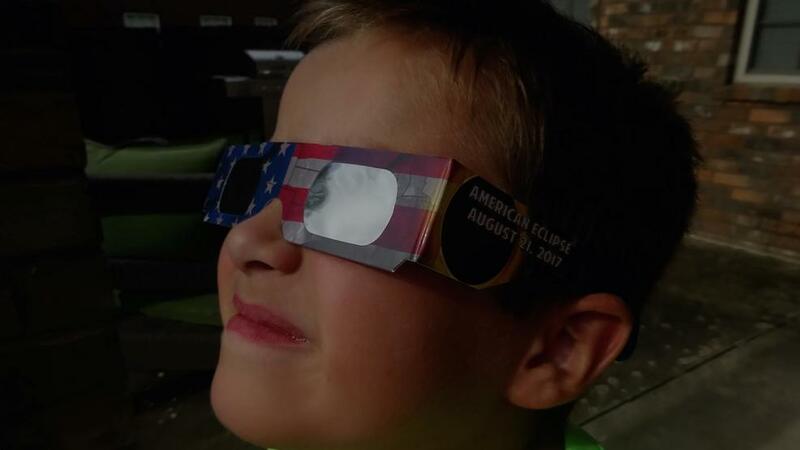 NSTA offered a free webinar (watch below) for teachers called "The Great American Eclipse of 2017" on Aug. 10, during which educators were invited to "learn techniques for explaining the eclipse and the science behind it to students and ways to observe the eclipse safely in small or large group situations." NASA held a Solar Eclipse Workshop for Educators on Aug. 8. NSTA also recommends the following blogs to teachers: Total Solar Eclipse on Monday, Aug. 21, 2017! and Science Teachers Needed to Support Libraries’ Solar Eclipse Events. Whether your children are still relishing their summer vacation or just have an eclipse day off from school, there are plenty of ways to impress upon them the significance of this rare celestial event. NSTA calls “When the Sun Goes Dark” by Andrew Fraknoi and Dennis Schatz, the illustrated tale of a 12-year-old whose grandparents teach her about solar eclipses, the “perfect resource to share with children.” The association recommends ordering a copy by Aug. 14 to get it in time for the eclipse. (Click here or see below to read a sample chapter.) For more, check out NSTA’s Science Resources for Parents page. NASA has created a map showing where official NASA events are being held at parks, libraries, laboratories, universities and more to celebrate the eclipse. For example, in Chantilly, Virginia, visitors can make their own pinhole eclipse viewers, witness the eclipse from safe solar telescopes, and attend portable planetarium shows for free at NASM’s Steven F. Udvar-Hazy Center. Contact a museum or science center near you to inquire about kid-friendly solar eclipse activities. If you are unable to attend such events or don't live near the path of totality, the Smithsonian Eclipse app, the brainchild of the Smithsonian Astrophysical Observatory, offers an interactive eclipse guide in addition to a NASA live stream of the event. Educators say this month’s total solar eclipse isn’t just another event for the history books - it’s a moment capable of sparking inspiration in young learners. “Students and kids that see a solar eclipse are part of a long line of humans that observed eclipses throughout history, and it may inspire some to keep exploring the universe in the future,” Ljungren said.